This is the first episode of Seinfeld that aired after Jerry Seinfeld announced the show was ending—which was, of course, shocking, because it was the No. 1 show on television and everyone was making buckets of money off of it. In retrospect, the move makes total sense, since the show does so well in reruns that they never had anything to worry about. But honestly, does the show seem like it’s running out of steam? Let’s discuss. I’m sure there were critics at the time arguing that the show was no longer at its best, and there are critics who’d say that now (I’m one of them). But when you compare the decline of this show to say, the one The Office is suffering, it’s much less severe. Any episode is gonna make me laugh plenty. I might have less lofty thoughts about it, but Seinfeld is a laugh-out-loud funny show even at its absolute worst. The reason I think there was more life in the show is that it’s trying to establish a different feel in these final seasons. “The Dealership” is in the same vein as classics like “The Chinese Restaurant” or “The Parking Garage.” There’s a simple task (Jerry’s going to buy a car for cheap at Puddy’s dealership) and because of a bunch of crazy circumstances, he ends up spending the whole episode there. But “The Chinese Restaurant” and “The Parking Garage” are so brilliant because nothing particularly strange is happening. The characters are in the restaurant because they’re waiting for a table, and sometimes you wait 20 minutes for a table. They’re wandering the garage because they can’t find their car, because it’s hard to find a car in a garage sometimes. The craziest thing that happens is Jerry has to pee. Here, there’s all kind of hijinks. Jerry’s sweet deal with Puddy goes awry when Puddy breaks up with Elaine again, so Jerry has to act like a car dealer and get them back together. George gets caught up in a battle of wills with a mechanic (and eventually everyone at the dealership) over his inability to get a Twix from the candy machine. Later on, he somehow obtains many Twix for some sort of scheme involving a blind taste test, but even the show can’t make sense of it, and where George gets the candy (or why he didn’t eat it considering how hungry he is the whole episode) is never explained. That’s all fine—it’s still funny! But it lacks the magnificent attention to detail in earlier episodes, where every single minute plot event balanced against something else, leading to that euphoric feeling of everything linking together. Here, when George is eating Arby’s at the end of the episode, it’s a cute callback gag—but just because Elaine and Puddy went to Arby’s earlier. Meanwhile, Kramer goes on a joyride test drive with a car dealer and it turns into a Thelma & Louise spoof, another example of the show taking aim at movies that came out a thousand years ago (seven, but still!). Since the dealership isn’t quite the comedic goldmine of a setting that the restaurant and garage were, it makes sense that Kramer couldn’t be shoehorned in. But the subplot isn’t really worth our time either. I think the best comparison here is the ninth and tenth seasons of The Simpsons,where the show was still really funny but suddenly seemed to be lacking whatever magic it had before. Had Seinfeld gone on for 20 years (not that it would have), it could have followed the same, slow, downward trajectory as that show, where you could catch a recent episode and still chuckle, but also sigh and think of bygone days. Here we have an episode that features a lot of Puddy and a lot of Newman. Now, that’s not a terrible thing. Not everyone’s a Puddy fan, but I definitely get big laughs out of the visual humor alone (him wearing the fur coat, and especially him wearing the 8-ball jacket). It strikes me, however, that Jerry and the gang feel a little less essential than usual. 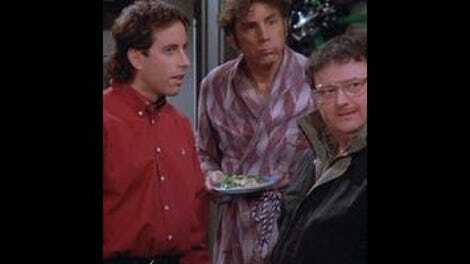 The two main plots of the episode involve Newman having an affair with the landlord’s wife (even though the landlord wants to evict him) and Puddy wearing a fur coat (which gets Elaine in trouble). The most-engaging B-plot belongs to George, who is very proud of his overstuffed wallet and won’t admit that any other way of life could be better. The least-engaging is Jerry’s desire to “get jiggy” and his insistence that he’s a really good party DJ, when by any objective measure he’d obviously be the worst DJ in the universe. He keeps insisting on saying “jiggy,” which is alarmingly current of him (Will Smith’s “Gettin’ Jiggy Wit It” was released as a single the day after this episode aired) but freaks me out. But mostly, we’re preoccupied with Kramer and Newman’s efforts to win over their landlord, played to stereotypical perfection by Jon Polito. He’s got the combover, the trophy wife (Svetlana), the hard-to-place accent. The only problem is that I don’t care if Newman gets evicted or not. My reaction is essentially the same as Jerry’s when Kramer describes the situation. 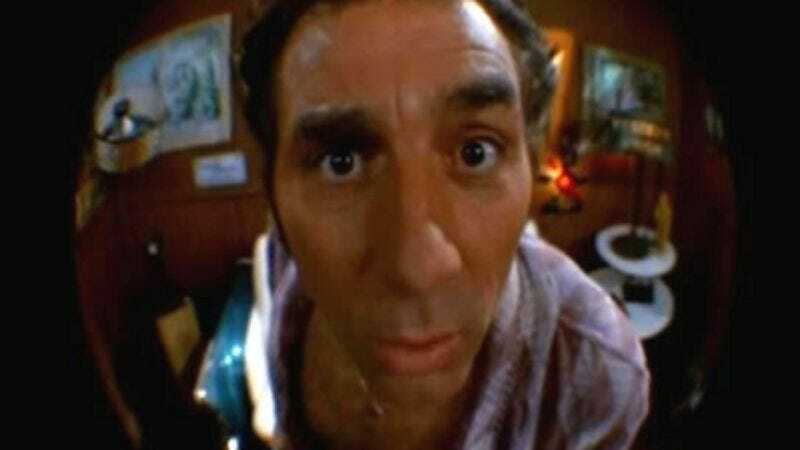 So this is is a low-stakes episode, even for this show, and all because Kramer decided to get a reverse peephole, which is a visual gag the show never really pays off. You keep thinking it’s going to figure into the plot in some major way, but the only good joke that arises is the secret peek that Newman takes at Kramer changing when he knows nobody’s looking. Very funny, very creepy, very Newman. The new low that Elaine encounters when she tries (and fails) to seduce Newman to get Puddy’s fur coat back is less successful. But what else is going on here? Joe Mayo doesn’t trust Jerry with the music at his party, so Jerry’s annoyed. On the plus side, he goes out with a woman and buys a silly man-bag that people make fun of (“It’s European!” he protests). George buys a massage chair that he likes because his heavy wallet is hurting his back. Elaine is generally sick of her life. George will sniff out a deal to buy a massage chair. “I have a sixth sense.” “Cheapness is not a sense,” Jerry quips. In George’s wallet: Irish money, an Orlando-area Exxon card, packets of Sweet’N Low.